Mobile Asteroid Surface Scout (MASCOT) landing site. Japan Aerospace Exploration Agency’s (JAXA) Hayabusa2 spacecraft. The Japan Aerospace Exploration Agency’s (JAXA) Hayabusa2 spacecraft will deploy in October the Mobile Asteroid Surface Scout (MASCOT). In consultation with more than 100 international and national partners, the MASCOT landing site was selected. MASCOT’s landing is scheduled for October 3, 2018. Mobile Asteroid Surface Scout (MASCOT) tucked in on Hayabusa2. 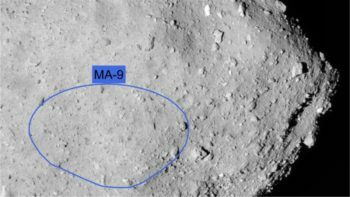 Also, the locations at which the Hayabusa2 spacecraft is expected to take soil samples have been designated, as have the sites where the three MINVERVA-II rovers will be placed on the asteroid’s surface. 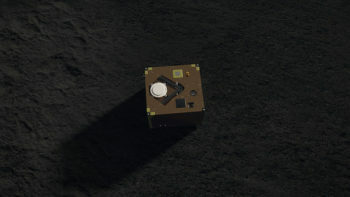 MINERVA-II-1 is a container that will deploy two rovers, ROVER-1A and ROVER-1B, developed by JAXA and the University of Aizu. The MINERVA-II-2 container holds the ROVER-2, developed by a consortium of universities led by Tohoku University. The landing site area has several advantages. Firstly, it is far enough from the regions in which Hayabusa2 will descend to the surface and take soil samples, therefore MASCOT and Hayabusa2 will not get in each other’s way as they perform their activities. 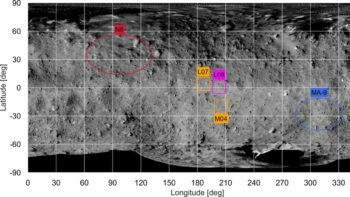 Secondly, the landing site lies in Ryugu’s southern hemisphere, so with the data collected by Hayabusa2 at the equator and MINERVA in the northern hemisphere, scientists will be able to gain good coverage of and investigate the over half-mile (950-meter-diameter) asteroid. The MASCOT lander is set to land on the blue-marked ellipse MA-9. The Hayabusa2 probe will approach the asteroid surface at location L07 (L08 and M04 are substitute landing sites, where it will take samples. The MINERVA rovers will be dropped off at the red marked landing N6. According to a DLR press statement, in the vicinity of the MASCOT landing site, there are numerous boulders up to 30 meters tall. But the really big rocks are not located in the MA-9 region. 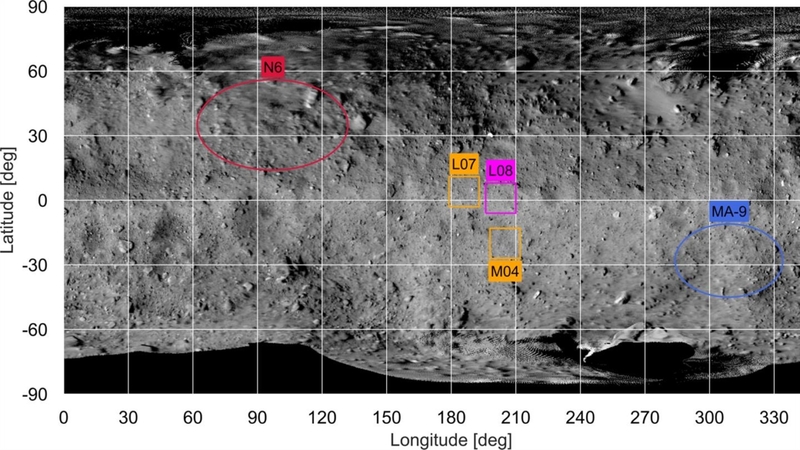 Images acquired by the optical navigation camera on the Hayabusa2 probe, explains the DLR, indicate that the landing site area probably holds fresher material that had little exposure to cosmic radiation, the particle flow of solar winds, as well as interplanetary dust – and is therefore still very primordial and in an unchanged state. 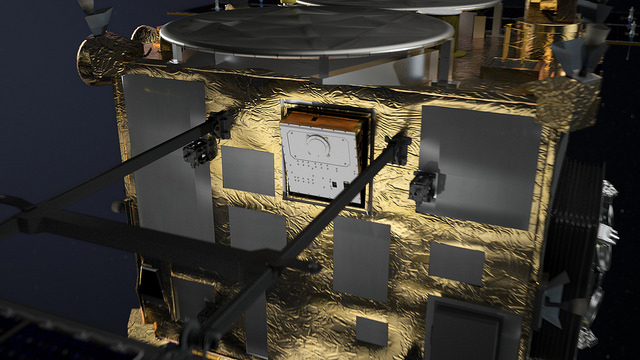 The German-French lander MASCOT on board Hayabusa2 was developed by the German Aerospace Center (Deutsches Zentrum für Luft- und Raumfahrt; DLR). It was built in close cooperation with the French space agency, Centre National d’Etudes Spatiales (CNES). 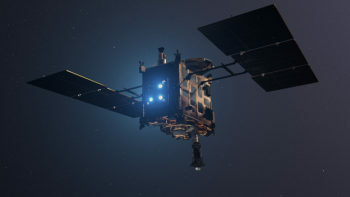 On December 3, 2014, the Japanese space probe Hayabusa2 embarked on a sample return mission to asteroid (162173) Ryugu (formerly designated 1999 JU3). Curiosity Front Hazcam Left B image acquired on Sol 2148, August 22, 2018. 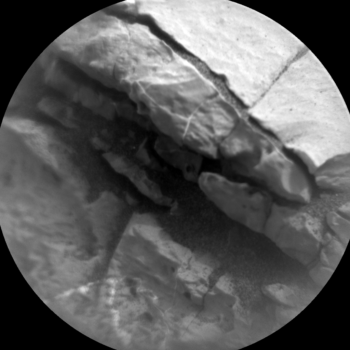 NASA’s Curiosity rover is performing Sol 2149 duties. The first two martian sampling holes, at Yellowknife Bay, are several kilometers away from the third hole, at Kimberley, Wiens adds, which is several kilometers from all the subsequent ones in the Murray formation. Curiosity Mastcam Right photo taken on Sol 2148, August 22, 2018. “The distances between the first several holes might be too long for golf links on Earth, but maybe with reduced gravity and very little wind resistance, a mighty drive of over a kilometer might be possible,” Wiens notes. Unfortunately, the size of the holes drilled by Curiosity, at roughly 16 millimeters diameter, are too small for golf balls…so golf enthusiasts will have to wait a little longer to play on Mars. Curiosity ChemCam Remote Micro-Imager photo acquired on Sol 2149, August 23, 2018. 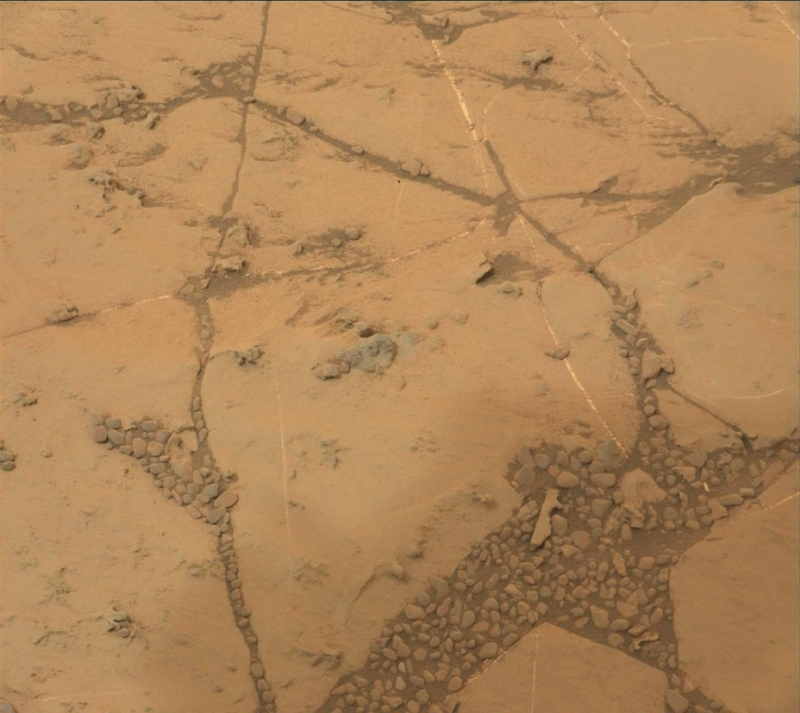 Golfing aside, Curiosity continues to analyze the samples from the Stoer drill hole. 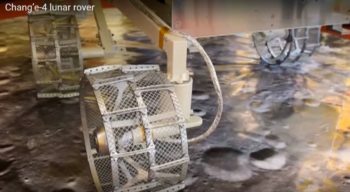 The rover and its robotic arm are stationary until scientists receive a green light from the Sample Analysis at Mars (SAM) Instrument Suite and Chemistry & Mineralogy X-Ray Diffraction/X-Ray Fluorescence Instrument (CheMin) analyses. The main activity of Curiosity recently is more analysis time for CheMin, which will run in the background, adds Wiens. In the meantime, Wiens reports, ChemCam gets to shoot its laser at “Ainshval,” “Tarskavaig,” and “Loch Aline,” which are interesting vein and concretion features on the rock surface in the vicinity of the drill hole. The robot has recently-imaged vein material and the rover’s Mastcam is set to image the new targets and also take another picture of the drill tailings. There are Mars Descent Imager (MARDI) change-detection images to be taken just after sunset and just before sunrise, Dynamic Albedo of Neutrons (DAN) active and passive observations are to be done, a dust-devil survey by Navcam, and Rover Environmental Monitoring Station (REMS) and Radiation Assessment Detector (RAD) data collects are also on the schedule. 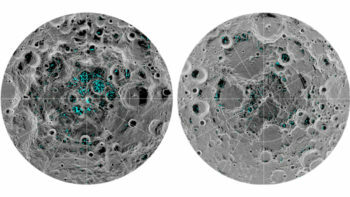 The image shows the distribution of surface ice at the Moon’s south pole (left) and north pole (right), detected by NASA’s Moon Mineralogy Mapper instrument. Blue represents the ice locations, plotted over an image of the lunar surface, where the gray scale corresponds to surface temperature (darker representing colder areas and lighter shades indicating warmer zones). The ice is concentrated at the darkest and coldest locations, in the shadows of craters. Because of the very small tilt of the Moon’s rotation axis, sunlight never reaches these regions. The Moon research community is beaming about the new evidence of exposed water ice in the lunar polar regions. NASA’s Moon Mineralogy Mapper, or M3, instrument flew aboard Chandrayaan-1, India’s first mission to the moon, and provided the first mineralogical map of the lunar surface. 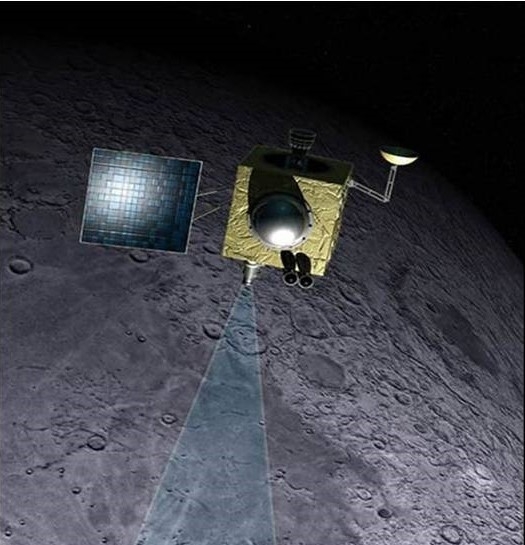 Using data from the NASA’s Moon Mineralogy Mapper (M3) spectrometer experiment, a team of researchers — led by Shuai Li of the Hawaii Institute of Geophysics and Planetology in Honolulu, Hawaii — searched for and found direct evidence for the presence of water in the permanently shadowed areas in polar craters on the Moon. 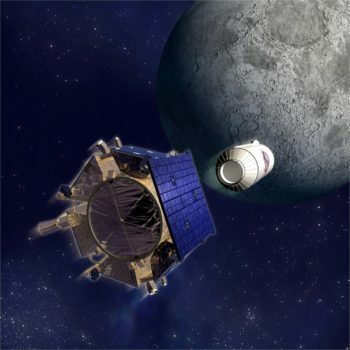 M3 flew as part of the scientific payload onboard the Indian Space Research Organization’s Chandrayaan-1 spacecraft that circuited the moon in 2008-2009. Previous data could not specifically verify the existence of water ice, but Li et al. 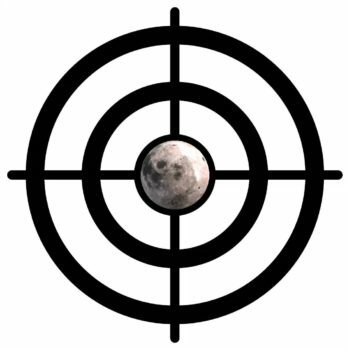 provide “robust evidence” for its presence on the Moon’s surface. “This is a critical paper as it demonstrates that we have four independent lines of evidence that there are surface ice exposures at the lunar poles,” explains Clive Neal, a leading lunar expert at the University of Notre Dame. “With the neutron data, we also know that these deposits extend into the subsurface. Therefore, we now have great maps that we can use to target prospecting surface rovers,” Neal told Inside Outer Space. Neal said as far as on-the-spot use of the water ice reserves, what still needs to known is the size of the deposits, the geomechanical properties of the regolith it is in, ease of extraction, bulk composition (impurities and the refining process necessary to produce clean water of life support and rocket fuel, etc.). Artist’s rendering of the LCROSS spacecraft and Centaur separation. Angel Abbud-Madrid, Director of the Center for Space Resources at the Colorado School of Mines in Golden, Colorado, also finds the new research exciting. “This new piece of evidence is valuable in that it provides additional confirmation on not just the presence of ice on permanently shadowed regions — which was obtained from previous instruments and from NASA’s Lunar CRater Observation and Sensing Satellite (LCROSS) impact mission in 2009 on Cabeus crater — but of water ice exposed on the surface in various well-defined spots on both the North and South poles,” Abbud-Madrid tells Inside Outer Space. “These data are of importance for prospecting and in-situ resource utilization operations related to water extraction from the lunar poles,”Abbud-Madrid adds. The locations of surface-exposed water ice described in the new study, he said, could be used to select potential sites for more extensive ground truth exploration to qualify and quantify the ice content on these regions. “This information is crucial to select the most appropriate extraction method to be used for ice exposed on the surface, as opposed to techniques to drill and recover subsurface ice,” Abbud-Madrid concludes. The new research provides “robust evidence” for the presence of water ice on the Moon’s surface, notes James Head at the Department of Earth, Environmental and Planetary Sciences at Brown University in Providence, Rhode Island. “If ice is at the surface, this means that much more could be buried at depth and covered and preserved below insulating soil, or diffused into and frozen in the soil layers,” Head advises. “This is very exciting news, and provides significant impetus for future international landings in the polar regions to drill and return samples of this ice. 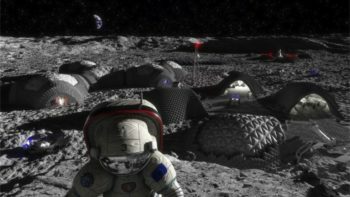 Ice deposits in significant quantities on the Moon could provide resources for future lunar bases and for fuel for future human exploration of deep space,” he states. Military Eyes on the Moon? As multiple nations have exploration crosshairs on Earth’s Moon, there’s also increasing discussion of the military utility of cis-lunar space and lunar territory too. 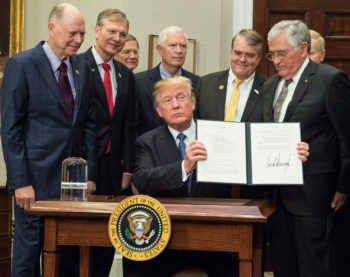 Meanwhile, a new Congressional Research Service (CRS) document says that, as a constitutional matter, it will be up to Congress to determine whether and how to reorganize the management of US national security assets in space, and whether to establish a new “space force,” as the Trump Administration has proposed. “The constitutional framework appears to contemplate that the role of establishing, organizing, regulating, and providing resources for the Armed Forces belongs to Congress, while the President is in charge of commanding the forces Congress has established using the funds Congress has provided,” CRS said in a new publication. Credit: Shuai Li, et al. The view that Earth’s Moon is a foreboding, dried out, desolate world may be all wet. 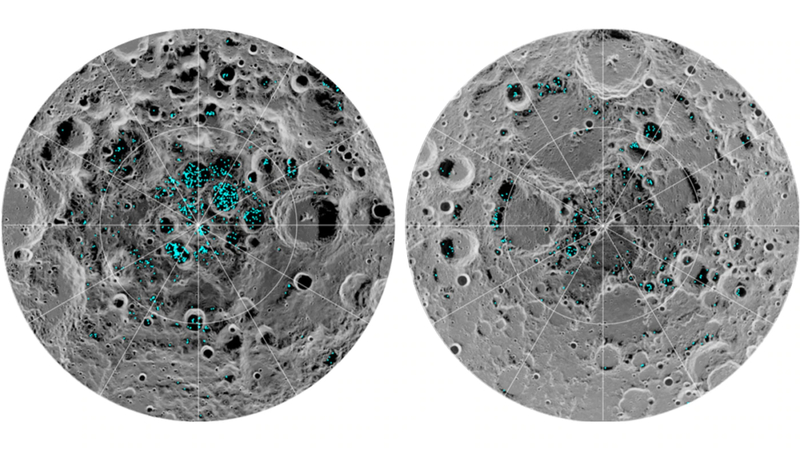 The first direct and definitive evidence for surface-exposed water ice in areas of permanent shadow at the moon’s polar regions is being claimed by a research team. The finding is based on detection of near-infrared absorption features of water ice in reflectance spectra acquired by NASA’s Moon Mineralogy Mapper (M3) instrument. It flew as part of the scientific payload onboard the Indian Space Research Organization’s Chandrayaan-1 spacecraft that circuited the moon in 2008-2009. Recent Curiosity Mars images of a “foreign object” on Vera Rubin Ridge show it moved from spot to spot. But why and what is it? 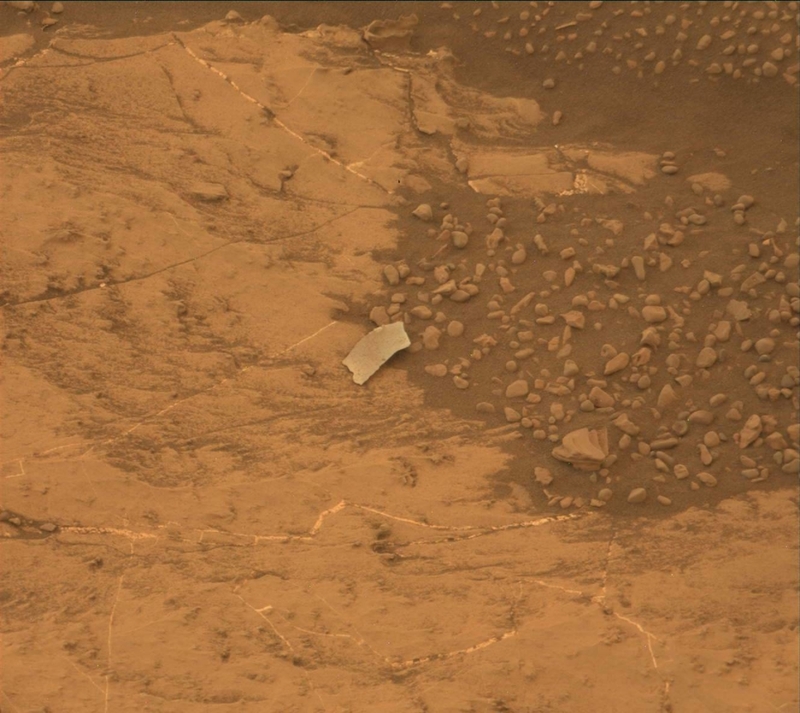 It’s an alien gum wrapper or a Martian band-aid, declared a few observers. 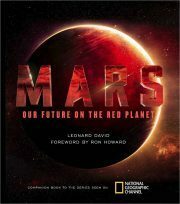 “Now I know where my lost sock went,” decried one Mars photo onlooker. Reported a few days ago, Brittney Cooper, an atmospheric scientist working on the Curiosity mission from York University in Toronto, Canada, identified the “Pettegrove Point Foreign Object Debris” (PPFOD). “I can simply say that the foreign object debris (FOD) was confirmed to be a rock with further analysis,” Brittney Cooper told Inside Outer Space. 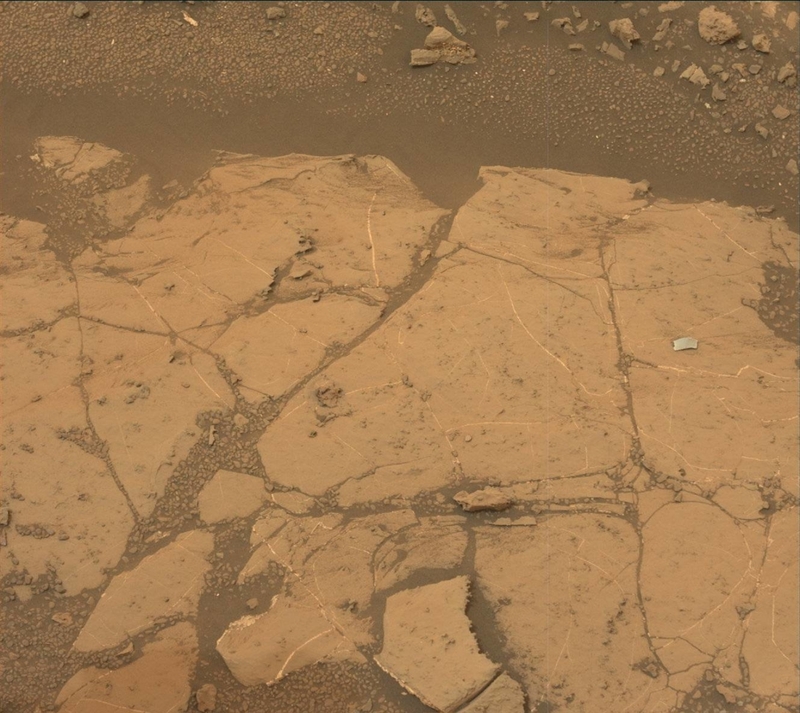 But the quarry quandary is that this object did definitely move across the Martian surface. Why? 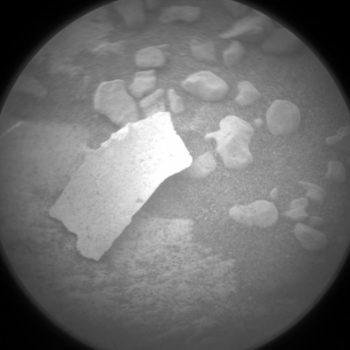 “The rock fragment was not present when we were in the area around Sol 2095. 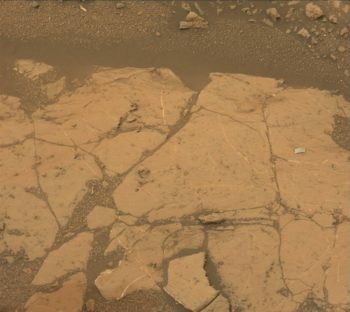 The rock fragment was still not there when we returned to the area a few weeks later on Sol 2130. 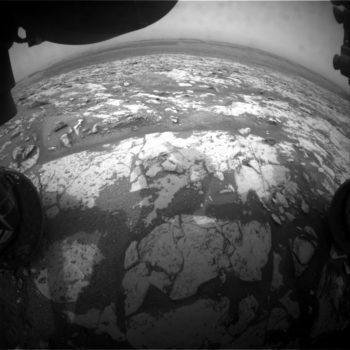 It was present after the final drive to the drill target on Sol 2132,” said Ashwin Vasavada, the Jet Propulsion Laboratory’s project scientist for Mars Rover Curiosity. During drilling, the fragment, thought to be FOD at the time, “was predicted to move, since previous drilling attempts all showed movement of small pebbles due to vibration from the percussive drilling,” Vasavada said. The dimensions of the rock were estimated to be 8 millimeters by 20 millimeters, 0.3 – 0.8 inches. 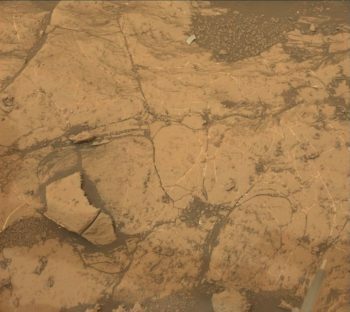 Mars researchers intentionally delayed close-up imaging and use of the robot’s Chemistry and Camera’s Laser-Induced Breakdown Spectrometer (LIBS) Vasavada said, until after drilling because of this. “It did move, as expected, but not from wind,” said Vasavada in information provided to Inside Outer Space. “It appears to be a fragment of rock that has a typical appearance and composition to other rocks encountered on the ridge,” he said. 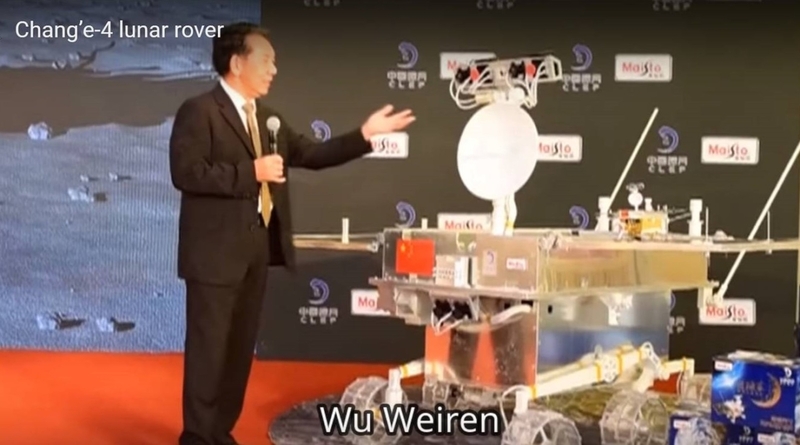 Wu Weiren, chief designer of the lunar exploration program, presents the Chang’e-4 rover. 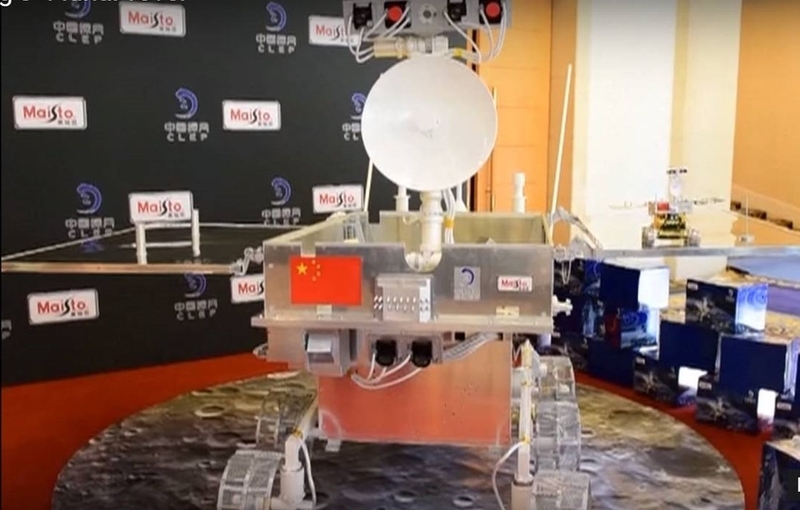 The rover for China’s Chang’e-4 lunar mission was presented in Beijing on August 14. 2018. The Chang’e-4 lunar mission — lander and rover — is scheduled to launch in December 2018 and will land in the Aitken crater, located in the Aitken Basin, in the South Pole region on the far side of the Moon, according to China Central Television (CCTV). 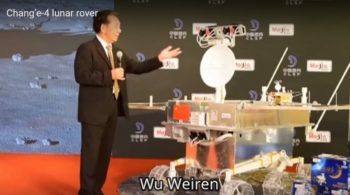 Wu Weiren, chief designer of the lunar exploration program, presented the rover. 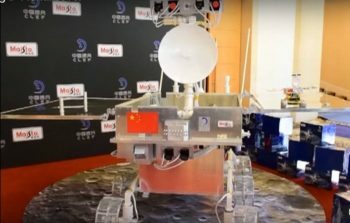 Wu said that the rover is modeled after the Yutu rover that was dispatched by the Chang’e-3 lander in December 2013. Close-up of Chang’e-4 rover wheel, one of six on the Moon machinery. Apollo 17 image of Aitken Crater that defines the northern rim of the South Pole-Aitken basin. 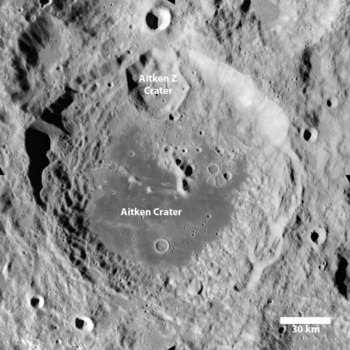 Aitken crater is about 84 miles (135 kilometers) in diameter. It is located on the northern rim of the South Pole-Aitken Basin, the largest preserved basin on the Moon. The crater has a central peak and much of its original floor has been buried by younger rock. Go to this China Central Television (CCTV) video showing the presentation of the Change’-4 rover. The U.S. Department of Defense’s 2018 report to Congress on Military and Security Developments Involving the People’s Republic of China has been issued, an annual look that includes a review of China’s space prowess. In the report several sections deal with China’s space activities, a program that “continues to mature rapidly,” the document notes. 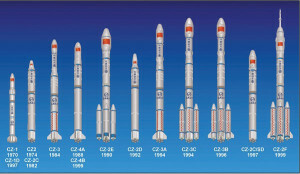 China’s People’s Liberation Army (PLA) has historically managed the country’s space effort, and continues to invest in improving its capabilities in space-based intelligence, surveillance and reconnaissance (ISR), satellite communication, satellite navigation, and meteorology, as well as human spaceflight and robotic space exploration. 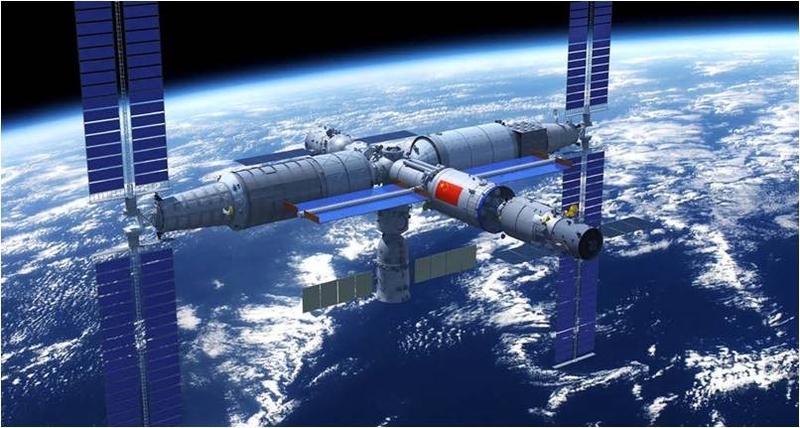 China has built an expansive ground support infrastructure to support its growing on-orbit fleet and related functions including spacecraft and space launch vehicle manufacture, launch, command and control, and data downlink. China is building upon a heritage of Long March boosters. 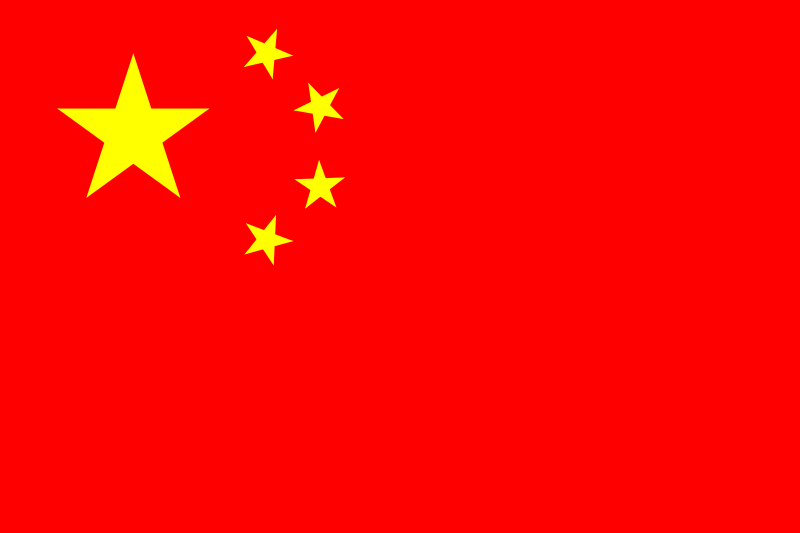 China seeks to enhance Command & Control (C2) in joint operations and establish a “real-time” surveillance, reconnaissance, and warning system and is increasing the number and capabilities of its space systems, including various communications and intelligence satellites and the Beidou navigation satellite system. China’s development of quantum satellites are also highlighted. The country’s priorities include “unconditional security of network data across long distances, ultimately creating a global quantum network of classical (i.e., non-quantum) data secured by quantum cryptographic keys,” the report says. 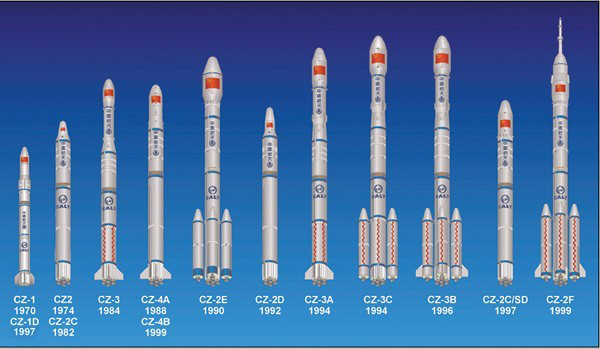 In 2017, China launched 18 space launch vehicles, of which 16 were successful, orbiting some 31 spacecraft, including communications, navigation, ISR, and test/engineering satellites. 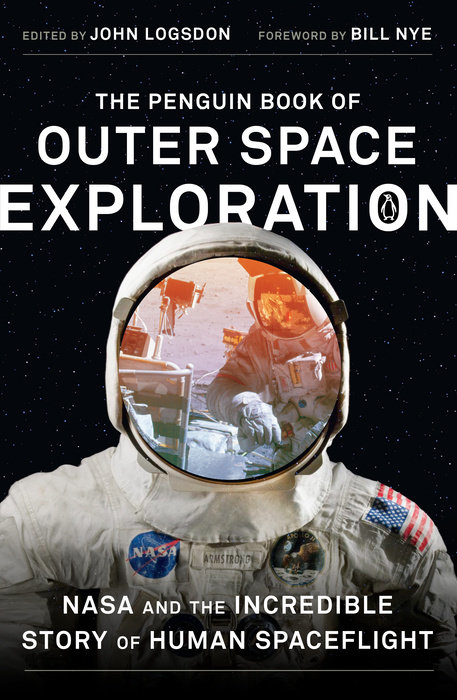 Other activities highlighted in the Pentagon report include space launch failures. 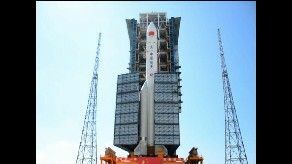 In 2017, China suffered two SLV failures within two weeks, creating significant delays in China’s national space program, according to key government officials. A Long March (LM)-3B partially failed due to faulty guidance, navigation, and control. A Long March-5 (LM-5) launch then catastrophically failed due to a manufacturing defect. The LM-5 is to become China’s new heavy-lift SLV, launching up to 25,000 kg into low Earth orbit and will play an important role in the assembly of the Chinese Space Station starting around 2018. 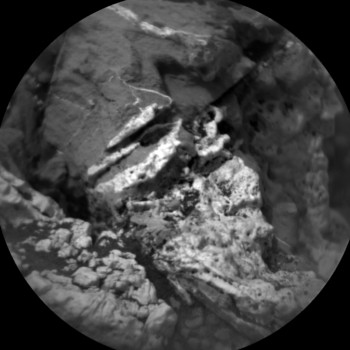 Curious Curiosity on Mars: Foreign Object Identified! Reports Brittney Cooper, an atmospheric scientist from York University in Toronto, Canada: Identified as the “Pettegrove Point Foreign Object Debris” (PPFOD), it was speculated to be a piece of spacecraft debris. In fact the object has been identified as a very thin flake of rock.